There is a balance in the equine skeleton. It surfaces with any inspection of the horse's structure. Not only are its left and right sides in principle alike. Horizontally, features before the rider's seat correspond with those behind it. Balance in the horse is not the balance of the human body. Upright human poise is easily defined. A useful definition of the horse's horizontal equilibrium, however, is still pending. Equine balance changes with posture, gaits and speeds. When the neck stretches and/or descends the center of balance moves fore. When head and neck rise the center of balance moves back. Despite these changes the rider's seat bones, or the plumb line in his forward seat, remain at thorax vertebrae twelve and thirteen in the equine backbone's center. The rider, in other words, inhabits a central place in the horse's dynamic balance. The term, "The horse is in balance," in singular, sounds convincing. However it misleads. It represents a felt equation. In addition to the dynamic balance typical of mammal movement patterns, the horse may choose from several postures. Presumable and/or actual balance have to do with the interaction of the horse's parts and how in relation to one another they are placed. We turn to a study of the equine skeleton and the information it may render in search of the modern horse's proper equipoise. The horse's head is balanced by the tail. The head is the seat of senses, mind and expression. The tail adorns, holds off flies and conveys the state of equine comfort. There are two set-ups in the horse's body, which make for riding. One is empowered by the rider's posture and interpreted by his dermatomes. The other is represented by his hands. It impacts the horse's internal body systems. These two systems meet in the horse's upper neck. The horse's upper neck is a stirring unit and a pivot in the horse's balance. Its finely tuned capacities comprise the organs of the neck (larynx, hyoid and thyroid), the occiput, two distinctly different first and second neck vertebrae and two unique connections, the yes-joint and the no-joint. Riders educated in a new modern equitation tune into these structural, nervous and energetic capacities to call on the very functions, which the horse consciously and/or spontaneously uses to monitor balance and locomotion. In the yes-joint between occiput and first neck vertebra the horse moves sideways to accompany the direction of the eyes, while ears remain level. The so called setting of the poll in equitation is the very same movement. 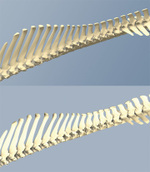 It brings about the longitudinal bend, which is a lateral curvature of the spine head to tail. In the lowered neck, nose on the ground, the yes-joint is fully closed. In Beizäumung the opening of the yes-joint activates muscular functions of neck and withers, which also benefit the back. A continuous ligament in the horse's upper line connects occiput and sacrum. It can be adjusted from the front and the back. The closing and/or opening of the yes-joint monitors its tension from afore. Sacrum and resilient haunches respond from aback. The long ligament communicates between head and haunches. 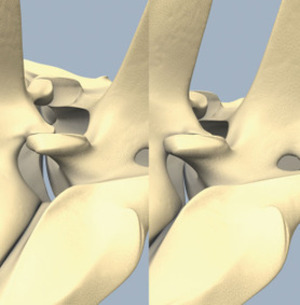 It is fine-tuned in the no-joint between first and second neck vertebrae. The yes-joint's range of rotation is almost 360 degrees. In contrast, the no-joint only closes and returns to its original position. It has no lateral lee-way and, if opened, pushes into the central nervous system. A similar thing happens in the sacral joint, when it opens too far. Both restrictive capacities are the horse's emergency stops. They function individually or combined. In the equine skeleton's balance the stirring unit in the horse's upper neck corresponds with four small vertebrae located between sacrum and tail. In academia these are viewed as part of the tail. They in fact anchor the pelvic diapraghm, which supports the effortlessness of core functions from aback, while the capacities of the stirring unit in the upper neck ensure it from the front. In practical terms the pelvic diaphragm releases and the tail rises when the tension of the long ligament is properly adjusted. Seven vertebrae in total mark the neck. The first sets the spine laterally. The second balances the long ligament. Four lower ones regulate the tension of the back muscles. The third neck vertebra supports the stirring unit in the upper neck/head and anchors muscular transitions from back to head. Flexions of the horse's neck first and foremost address the functions of the stirring unit. Done properly they realign the diagonal, lateral, ventral and if needed dorsal fascia trains in the horse's body. How to do flexions and their correspondence to the individual horse's physical needs is discussed in a further chapter. In the balance of the equine skeleton the five lower neck vertebrae counter-balance the sacrum. The sacrum originates as five individual vertebrae, which by the time the horse is grown have fused into one peculiar bone with two distinct little wings. These connect to the pelvis. The equine sacroiliac joint is a firm attachment of these wings to the pelvis with little or no range of movement. In the human core energy rises from a release of the sacroiliac joint. Similar functions in the horse remain to be researched. Between neck and sacrum expands the backbone. Eighteen trunk and six lumbar vertebrae, that is a total of twenty-four, divide into three sections of eight each. They are distinctly formed for the functions they perform, providing for stability, flexibility and the horse's power. Each will be addressed individually in forthcoming chapters. Together they constitute a cantilevered bridge, which at its center bears the rider. This bridge in front is supported by the horse's front legs. From behind the horse's hindquarters mount, lift and propel it forward. Lumbar vertebra six and the sacrum connect in the sacral joint. This small pivot of great power in the croup's highest point has a limited, yet clearly defined range of motion fore and back. When it closes the horse's back can't help but mount. The croup flattens. When it opens, either back or tail drop and the croup gets round. The shearing power of the inner hind leg's support of the horse's weight on the sacral joint requires further research. Motions between lumber area and sacrum in the sacral joint do effect the mobilization of the hindquarters. In powerful movements, such as the take off for a tall jump or the passage the croup is flat. In reduced movements, such as the sliding stop or the piaffe the croup is round. The race horse in each stride alternates between a short rounded and a long flat croup. In the sacral joint the horse's locomotion, posture and balance interact with the rider's control. From it the horse manages its own and the rider's weight, while sustaining movement. In the horse's perpetually tuned equilibrium the rider inhabits the central place. The term, "The horse is in balance," as if there was but one point of balance, applies because of the horse's unique ability to negotiate, in the rider's service, adjustments between sacral joint, back and haunches with the placement of withers, neck and head. Details of exactly how this takes place are subject of upcoming chapters. In addition the long ligament communicates between the pivot points of upper neck and croup. In a new modern equitation the rider from his seat energetically supports the horse's elevated posture. The neck rises before him. His hands communicate with the horse's mouth and help it master gravity while staying in touch. The sacral joint is the root of the horse's dynamic balance. This definition takes on additional meaning, when one considers human and equine nerve distributions. Equine sacral nerve sections two and three of the central nervous system, which along with neighboring nerve sections innervate the horse's hind legs, rest in the rear pivot's center. Human sacral dermatomes two and three, which are innervated by corresponding nerve sections, on the other hand, are the skin regions which cover the human seat and inner legs. The correlation is as astounding as it is obvious. Equine posture and locomotion correlate with that part of the rider, which is in direct contact with the horse's surface. Here this text originally ended. In ensuing 2005 research month and increasingly so in 2006 the nerve section C8's role in equitation became appearant. This nerve section without corresponding bone structure is located at the front of the cantilevered back bone. It is balanced by nerve sections S2/3, which are located in the sacral joint at the rear of the cantilevered backbone. From C8 the horse lowers head and neck to grase. From here it lifts the head to pick an apple from the tree. From C8 it poises itself. From C8 it as well turns and bends. In the human body one skin region, the dermatome C8, is innervated by nerve section C8 directly. This dermatome proceeds from the spine between neck vertebrae seven and the first thorax vertebra at the widest rearward extension of the shoulders and covers arms, elbows and ring fingers. It delineates movement. Motions of C8 away from the body support human movement and expression, motions of C8 towards the body restrict them. A corresponding skin region in the horse proceeds from the highest elevation of the withers where its hight is measured. It continues down vertically, covering the tip of the elbow and the posterior of the front leg in one upright line. To date it is not known if this strip of skin represents the equine dermatome C8, or - to go one step further - if dermatomes in fact even exist in the horse. Movement of this drawn out skin region, analog to dermatome C8 in the human body, represent the horse's expressiveness. As seen for instance while rearing, in well elevated side passes or in jumping. Equine nerve section C8 at the front of the cantilevered backbone is located in the center of the horse's forehand. It ought to be in line with the sacral joint and the nerve sections S2/3 at the rear of the backbone. Dissalignments most often are caused by the horse's warp. The irregularity in the horse's structure originates in the first spinal projection of the flexible middle section, thorax nine. In the modern horse it and several surrounding spinal projections often lean to the right. To balance resulting maldistributions the neck base tends towards the left. The croup steps to the right. These dissalignments hinder human/equine correlation. The modern horse is warped, with or without rider. Alone it manages forward locomotion, turns and jumps, and without effort compensates for these irregularities. Made straight, however, the flow of nerve impulses from the central to the peripheral nervous system may be restricted; if not permanently, so initially. Why not ride the horse as it is, the reader may ask. Because I can't direct it, the rider will answer. Here then is modern equitation's dichotomy. Nerve sections C8 at the cantilevered backbone's front and S2/3 at its end, which correspond with the rider's ring finger, seat and legs, must be aligned. The adjustment of their imperfect alignment on the other hand causes trouble. In practical application the following picture evolves. When the horse grazes the neck is lowered from the base. 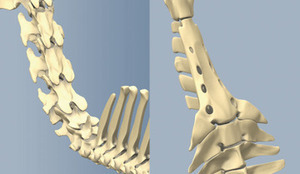 The lower joints of the neck are opened to the maximum. Both yes- and no-joints are fully closed. Nose and upper neck, from the withers to the nose, form one line. If - while grazing - something catches the horse's attention, neck and head rise. Ears and occiput move forward and the yes-joint opens. The eyes sharpen and the head rises to the max. The horse is poised for action. In the process the no-joint closes and alerts the sacrum. Perceptions of ears and eyes activate the psoas, the inner most muscle system of the pelvis, which in the horse connects the underneath rear backbone with pelvis and upper thighs. The horse is ready to go. Under saddle the same basic principles apply. In general, the lower the head the less prepared the horse will be for action. The higher the head the more likely it will poise itself for action. The informed rider will appropriate this information and go for supple and equilateral haunches. Using the shoulder-for, the straight and moderately angled version of the famous shoulder-in, he will position the horse's shoulders slowly and progressively more in such a way that both hind legs will track towards the center of weight. In the process he will teach the horse to yield to the neck rein and give in the ribs.